Everybody will, like true crew-members, be involved in sailing and participate in all everyday life activities on board. Sailing experience is not required. 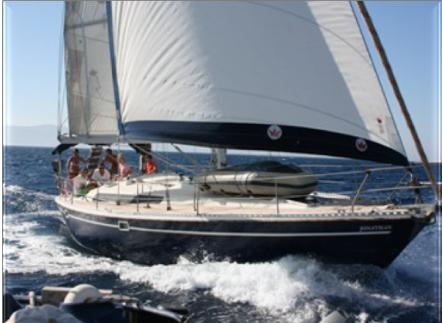 Our skippers have extensive knowledge of the Cyclades Islands and are excellent guides. Itineraries may be changed according weather conditions. The embarkation is on Sunday at 6 p.m. and the disembarkation is on Sunday at 10 a.m.
*On request we can arrange other itineraries in the Aegean sea. In these prices are included: Your lodgings aboard, bedding & linen and the services of the skipper. An on-board kitty 320 € /week is set up for the meals aboard and at the taverns (skipper included), port fees, water, fuel and the end cleaning of the boat. Consumptions bar, transfers, vehicle rental, tours of sites and museums are not included in the board kitty.